It's easier than you might think to make the perfect prime rib roast. Place roast in a shallow roasting pan. Combine the butter with the garlic, onion and seasonings. Spread the butter mixture over the surface of roast. Sprinkle the salt over the butter. Let stand until the roast is at room temperature (1 – several hours). Place the roast in the preheated oven for 15 minutes or until the roast starts to brown and is “seared.” Reduce the heat to 300 degrees and continue roasting for 15 – 18 minutes per pound. 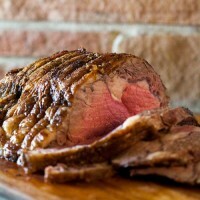 Allow the prime rib to rest for about 15 – 20 minutes prior to carving to allow the juices to settle. In a small saucepan, over low heat, warm the mayonnaise, horseradish, lemon juice and mustard. Heat, stirring occasionally, until warm and combined. Add the sour cream and heat just until warm. * Notes: Cook times are approximate and will vary depending on the size of your roast and your preferred level of doneness. Total time for this recipe includes standing time for the roast to reach room temperature before cooking begins.